Couzinié, S. ; Laurent, O. ; Chelle-Michou, C. ; Bouilhol, P. ; Paquette J.L. ; Gannoun, A.M. ; Moyen, J.F. Combining U–Pb and Lu-Hf isotopic data of detrital zircon grains has proven a powerful tool to unravel the provenance of sediments and address continental crust evolution. 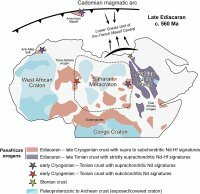 In this study, we explore the origin of thick siliciclastic metasedimentary units from the high-grade internal domains of the Variscan belt of Europe and examine their significance for Neoproterozoic crust formation and evolution along the North Gondwana margin. We present data and U–Pb/Lu–Hf systematics of detrital zircons from five amphibolite-facies metasediments sampled in the eastern French Massif Central, measured in situ by LA–(MC)–ICP–MS. The sedimentary protoliths were deposited in the Ediacaran as evidenced by field relationships and maximum depositional ages ranging between 592.4 ± 5.5 and 556.8 ± 5.1 Ma. All samples contain three main zircon populations in terms of age distribution and Hf isotopes : (i) abundant 0.55–0.65 Ga zircons with considerably scattered εHf(t) from −19 to +14 ; (ii) varied amounts of 0.65–1.0 Ga zircons showing dominantly positive εHf(t) with the exception of the c. 1.0 Ga zircons ; and (iii) ≥1.8 Ga zircons (mostly between 1.9–2.1 and 2.5–2.8, up to 3.2 Ga) with εHf(t) ranging between +5 and −7. Multidimensional scaling of our U–Pb dataset and a data compilation of Ediacaran to Lower Cambrian (meta)sediments from the North Gondwana margin reveals that the relative proportions of the three age components carry discriminant provenance information. Geological data indicate that the Ediacaran basins of the eastern French Massif Central collected the erosion products of two main source regions : (i) the Neoproterozoic Cadomian magmatic arc ; and (ii) the cratonic hinterland, mostly from the Saharan Metacraton and the Arabian-Nubian Shield. Our dataset attests to the reworking of : (i) juvenile Neoproterozoic crust and, (ii) old Paleoproterozoic to Neoarchean crustal components, either as part of the detritus or incorporated in Neoproterozoic arc magmas. First-order estimates derived from the isotopic signature of S-type granitic magmas sourced in the Ediacaran metasediments suggest that 60–75% of the detritus would correspond to young Neoproterozoic crust and thus represent net additions to the continental crust volume.